Road: About 50 km from Pune on the Pune-Ahmednagar highway. Rail: Alight at Uruli railway station on the Pune-Solapur line. The temple is situated 16 km from the station. 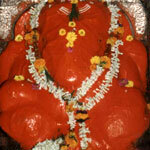 Shiva is believed to have worshipped Ganesha before fighting the demon Tripuraasura here. The mandap of the temple was built by Sardar Kibe of Indore Sardar Pawar and Sardar Shinde also contributed to the construction. Malharrao Holkar and Yashwantrao Chandrachud maintained the temple precincts. The sanctum was built by Madhavrao Peshwe. About sixteen km from the temple stands the samadhi of Shri Limbaraj Maharaj.